The Diary of a Nouveau Soccer Mom: Soup time! Now that we are official Colorado residents, we've discovered something very important. October/November in Colorado? It's a heck of a lot colder than Texas. Shorts season ended pretty much as soon as we arrived here back in September, we've had to pull out hats, coats and mittens, my mom had to send the kids their snow boots, and we've already had two snows. So that leaves us with 4 very cold family members, 3 of whom have to leave the house daily for work and school. Me? I work from home and get to drink coffee and wear my fluffy slippers. However, I've discovered the secret to warm lunches at least. 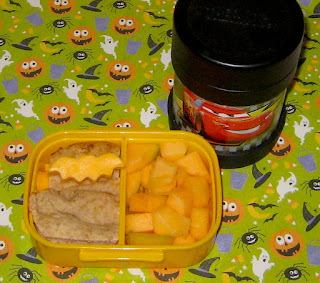 This was Ben's lunch last week, pre-Halloween. Note the thermos? It's filled with homemade chicken soup that was still piping hot at lunch time! Faith has one too, but with Princesses on it, and Shaun opted for a manly stainless steel and black version. But there is a trick to keeping things hot till lunchtime. First, boil water. Fill the thermos with the boiling water and put the cap back on it, let it sit. Second, heat your soup. Boil it, not just warm it. You pretty much want it boiling hot. I actually skip the microwave and use a little stove top kettle to make sure it really does boil. Third, dump the boiling water, then immediately fill with boiling soup. Wipe rim and seal immediately. The catch seems to be that, if the container is already warmed from the water, the soup doesn't cool off that little bit from the cold container, thus staying warm longer. Shaun reported that he tried to drink his soup at lunch time (noon for him) and it was still too hot, after I had prepped it around 7:15 am. F&B have said the same thing, that they have to open their soup, eat a few other things, then drink their soup after it cools a bit. In case you were curious, Shaun has this Thermos with the built-in spoon , while F&B have the Funtainers (in Princesses and Cars ). We spent a little more to get containers we knew would seal tightly and not leak.